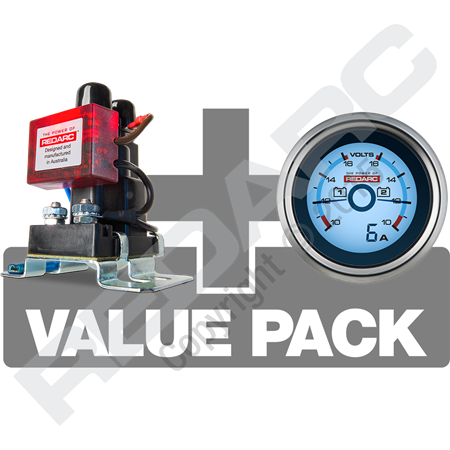 The REDARC 'SBI Value Pack' comes with a REDARC dual voltage gauge (G52-VVA) and a 'Smart Start Battery Isolator' (SBI12). This Value Pack offers a complete power management and monitoring solution designed to meet the demands of 4WD, caravan, recreational and commercial vehicles. If visual monitoring of your 12 Volt battery setup is required, this pack represents great value with a 10% discount off the purchase of both products separately. The Smart Start® SBI is a microprocessor-controlled battery isolator designed for use in multi-battery applications as a solenoid priority system, protecting the start battery from excessive discharge, whilst allowing the auxiliary battery to supply non-essential loads. 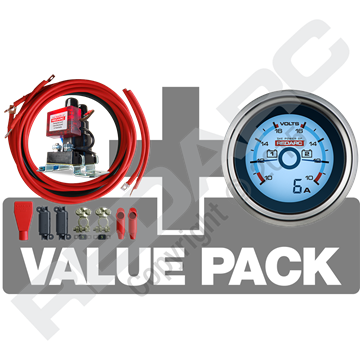 The REDARC Smart Start® is designed primarily for use in 4WD and commercial vehicles. 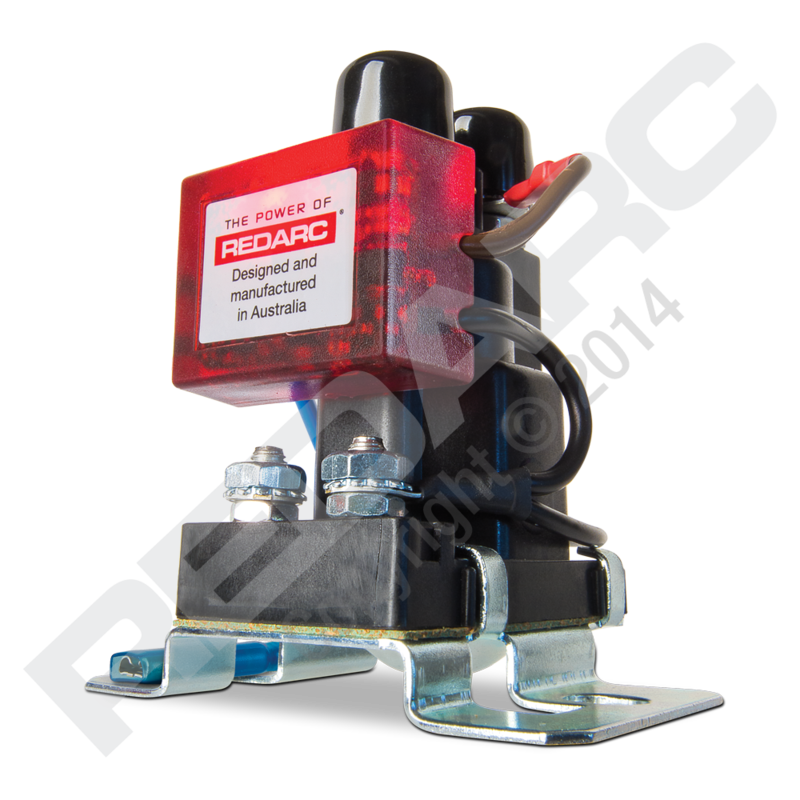 The REDARC Smart Start® is Australia’s most trusted dual battery isolator and is used by 4WD clubs throughout Australia. The REDARC 52mm dual voltage gauge is ideal for a battery systems mounted in 4WD's, Campers, Caravans, Motorhomes and other similar vehicle applications. The LCD/ LED display allows you to monitor the charging performance of both your main and auxiliary batteries. In the event of an alternator or system failure, the voltage reading on the gauge will be low and drop as the battery discharges. In the event of an overcharge condition, the voltage reading will climb above its normal zone. 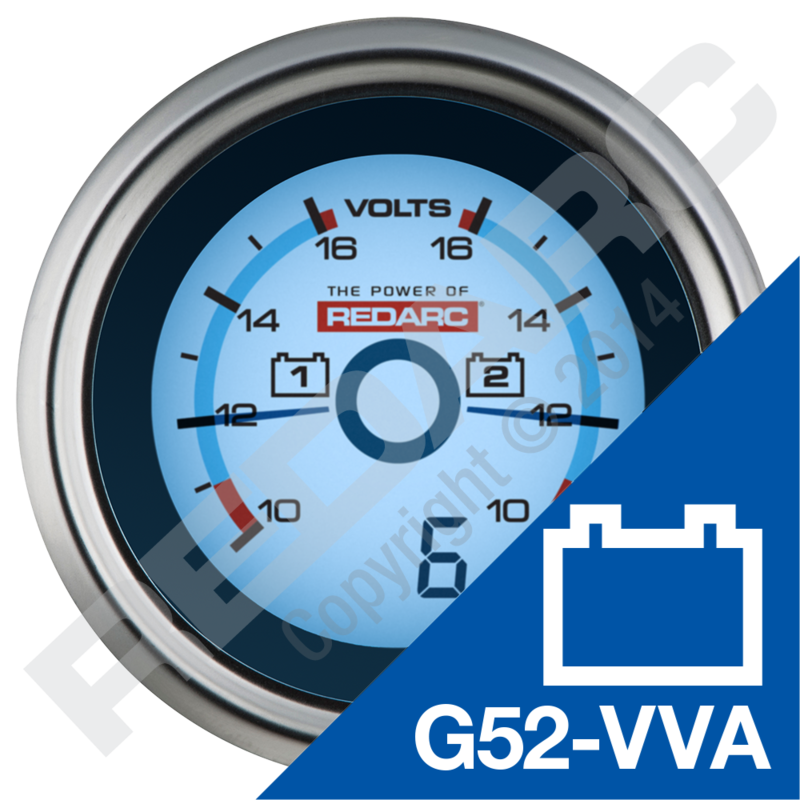 The G52-VVA gauge also has pre-set alert levels (<11V and >16V) to notify you of these situations by changing the gauge backlight colour to either amber or red, and initiate an audible beep when the vehicle's ignition is on. When extra protection is required, the G52-VVA is the perfect accessory for a REDARC dual battery isolator (SBI12) or in-vehicle battery charger (BCDC range) where 12 volt batteries are installed. It’s a visual monitor of product performance and battery health. The G52-VVA gauge diameter requires a 52mm hole for mounting. REDARC offer a range of mounting solutions including a 2” black plastic mounting cup (GH-CUP) and one (GH-MP1), two (GH-MP2) and three (GH-MP3) hole gauge mounting panels. Radio inserts are also available that suit the Toyota Hilux (GH-HILUXR05). Multiple alert levels with amber or red backlight and audible beep - Alerts when Voltage drops below 11V or climbs above 16V.